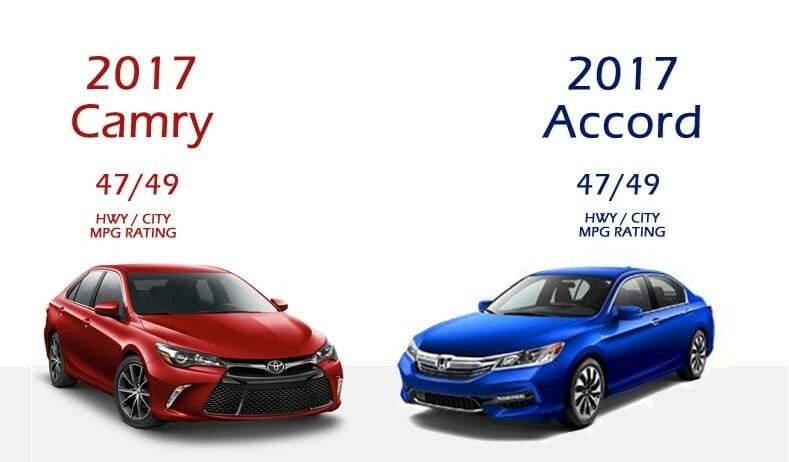 Toyota Camry vs The Honda Accord: Which is the Right Choice For You? There are only two weeks left until the New Year, and that means many end-of-year specials will be over. So if you are in the market for a new sedan, now is the time to buy. But what should you get, a Camry or an Accord? There are plenty of other sedan options out there, but if you want the highest selling and best performing sedans on the market, it’s narrowed down to these two. The Toyota Camry and Honda Accord are similar in many ways: both offer six and four-cylinder engines, comfortably seat five passengers, and have a similar design. But, between the two, one does operate on a higher level. Let’s look at a few of their differences. In shape, the Accord is slightly sportier with its aerodynamic line work and curvature. Inside, the Camry comes standard with a power driver’s seat on all trim levels. The Accord does not offer this at all with its base model. Both have a touch-screen display, but the Accord’s is complicated and often frustrating to use. The Camry has an easier to understand and use inner operating system. As far as reliability goes, both sedans do better than any other, but the Camry tops the list. The four and six-cylinder engines to the Camry tend to last a little longer, need less maintenance, and provide a smoother, softer ride. Aesthetically, the Accord does very well. It has comfortable seats, a warm interior atmosphere, and it manages to hold its exterior shine. The Camry is comfortable and sleek as well, but overall, the Accord does better here. So what is more important to you, reliability or aesthetics? For most drivers, it’s reliability. And though both sedans offer high levels of both, the Toyota Camry has proven itself the one with more longevity. 0 comment(s) so far on Toyota Camry vs The Honda Accord: Which is the Right Choice For You?